Rory O’Neill took to the Abbey stage last night to deliver oration on how homosexuality is still stigmatised in Ireland. Panti, aka Rory O'Neill, takes to the stage of the Abbey Theatre last night. TODAY, AROUND 2,000 people congregated in Dublin city centre to protest at the treatment of debate around homophobia on RTE. This was sparked by RTE’s redaction of comments made by Rory O’Neill, also known as performer and gay activist Panti Bliss, on The Saturday Night Show on 11 January, around defining homophobia in modern Ireland. The broadcaster later issued an apology and – it emerged today in several Sunday newspapers, and RTÉ’s news bulletins themselves – paid out over €80,000 to members of the Iona Institute Catholic lobbying group. Last night, the Brendan O’Connor-hosted Saturday Night Show held a debate on homophobia but that didn’t prevent today’s protest, organised by LGBT Noise and attended by other groups and individuals who support equal rights for gay people, from going ahead. It also didn’t prevent O’Neill – in full regalia as alter-ego Panti Bliss – from making an oration last night at the Abbey Theatre in Dublin on how it feels to be subject to prejudice because of one’s sexuality on a daily basis. The speech came after a performance of James Plunkett’s 1913 Lockout drama The Risen People in the national theatre. Video made with the help of Conor Horgan, Caroline Campbell, Nicky Gogan and Ailish Bracken. With thanks to cast and crew at the Abbey Theatre. 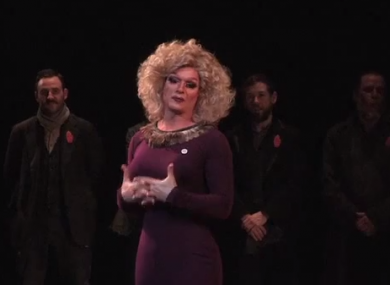 Email “Watch Panti’s powerful speech about oppression of gay people”. Feedback on “Watch Panti’s powerful speech about oppression of gay people”.